Even though it’s hard to believe, kids’ movies weren’t always so safe — especially the live-action ones. That’s probably what director Ava DuVernay meant when she introduced an early screening of her new movie, A Wrinkle in Time, by saying that she wanted to make an old-school Disney movie like 1975’s Escape to Witch Mountain, a thriller about orphans with psychic powers who discover they’re actually aliens. She’s also spoken fondly about other bygone live-action family films such as 1984’s The NeverEnding Story, which was about a bookworm who goes on an incredible journey and occasionally rides on the back of a big flying-dog creature. These movies, and others of the era (like The Dark Crystal), were deeply weird, boasting funky visuals and dark tones that made you wonder if the filmmakers were stoned, deeply disturbed or both. DuVernay’s film, which is based on the Madeleine L’Engle book, isn’t quite as bizarre as its predecessors, but it possesses some of the same “Who is this movie even for?” vibe, which I consider one of its strengths. It tells the story of a preteen girl, Meg (Storm Reid), who travels to a fantastical realm to rescue her scientist father Alex (Chris Pine), along the way meeting several cosmic beings and getting into all kinds of trippy altercations. Actors like Oprah Winfrey, Reese Witherspoon and Mindy Kaling walk around like they’ve been blasted by a glitter cannon at close range, and the visuals are a combination of 2001 and Tim Burton, mixing sentimentality and scariness. The movie doesn’t always work — the storytelling meanders, and some of the big-name actors ham it up — and yet, I dug A Wrinkle in Time more than most critics did, in part because I really valued how genuinely weird DuVernay was willing to go. There’s a whole sequence that takes place on a cosmic beach that’s seemingly where Timothy Leary summers. 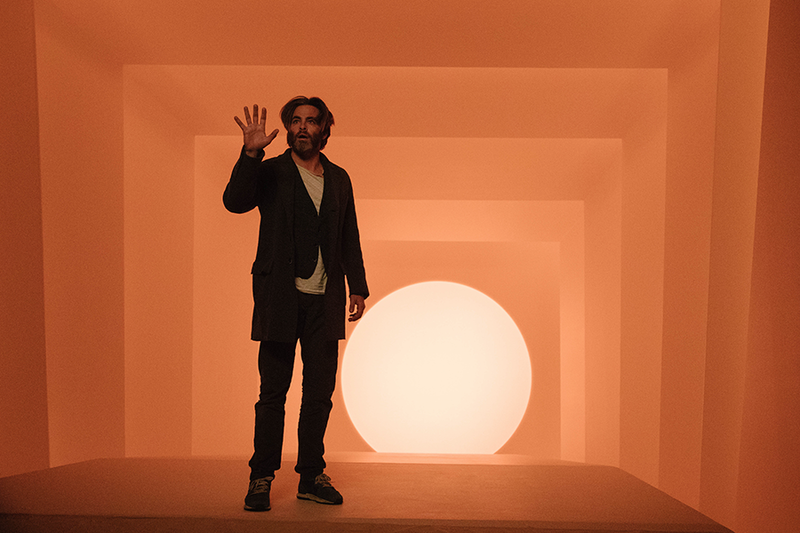 And Alex’s prison looks like a bizarro twist on a James Turrell art exhibit. A friend of mine joked that Meg’s journey isn’t that different than the one Natalie Portman’s character goes on in Annihilation, where an alien presence called the Shimmer mutates the DNA of everything it touches, and the comparison is freakier than you might imagine for a kid’s movie. A Wrinkle in Time is as unwieldy and uneven as The NeverEnding Story or The Dark Crystal, but what it shares with those inspirations is an acknowledgment that childhood itself is strange. We’ve gotten so used to parents posting pictures of their kids on social media that it’s created a caricature of adolescence: always smiling, always lovable, always precious, always perfect. But movies like A Wrinkle in Time speak to all the uncertainty that can affect kids as they’re trying to understand their feelings about their parents, their classmates and their place in the world. And with its kaleidoscope of surreal worlds and bizarre characters, A Wrinkle in Time is kind of like Alice in Wonderland or The Wizard of Oz, transforming recognizable childhood anxieties into a fantasy realm that only heightens the prickly emotions. As such, kids watching Wrinkle today may be confused and even traumatized by parts of it. When they grow up, they won’t consider it any kind of masterpiece. But it’ll stick with them, and they’ll probably say, “Yeah, remember that movie? Man, it was fucked up.” Yet, amidst the expert polish of Pixar, there’s room for this kind of kids’ movie, too. #1. Chris Pine is an awesome dad. A Wrinkle in Time features a breakout performance from Reid as the young woman who comes into her own on this quest. But the movie is also a reminder what a MVP Chris Pine has been lately. He’s still probably best known for playing James T. Kirk in the Star Trek reboots, but that’s maybe his least interesting role. In recent years, he showed his dramatic side in the crime thriller Hell or High Water and his goofy side as an ineffectual prince in Into the Woods. And he was great as Diana’s love interest in Wonder Woman, expertly executing the gender flip of being subservient to the more dynamic female protagonist. In the new movie, he’s asked to play an impossible character: an ultra-sensitive, incredibly kind and brilliant astrophysicist who teaches Meg to believe in her dreams. Basically, he’s Super Woke Dad, but Pine turns that aspirational cliché into a believable character, one you can imagine a lot of young boys and girls probably wished they had as their father. It’s really hard to play a good guy: Go too far in one direction, and the character’s just a wimp; go too far the other way, and he seems like a self-righteous jerk. Alex is far from perfect, as we’ll learn, but Pine plays him perfectly, conveying the right combination of compassion, humor and goodness that makes you think of other Super Woke Dads at the movies, like Gregory Peck as Atticus Finch in To Kill a Mockingbird. No dad is this amazing in real life, but Pine makes you think for a couple hours that, maybe, they could be. #2. DuVernay’s best movie is still her first — which you probably haven’t seen. Before A Wrinkle in Time, DuVernay directed 13th (a documentary about America’s racist prison system, which was nominated for an Oscar) and Selma (the Martin Luther King Jr. biopic, which was nominated for Best Picture). But for my money, her best movie is her under-the-radar debut, which earned acclaim at Sundance in 2012 but didn’t get a very wide release. Middle of Nowhere stars Emayatzy Corinealdi as Ruby, a kindhearted L.A. nurse facing a horrible reality: Her husband is about to do an eight-year prison sentence, forcing her to be his loyal support system while he’s locked up. But the crueler that her husband becomes — and he was hardly a saint beforehand — the more she becomes attracted to her local bus driver, played by David Oyelowo, who went on to play MLK in Selma. DuVernay is strongest as a filmmaker when she’s chronicling the relationships between characters in intimate spaces. Some of the more effects-heavy sequences in A Wrinkle in Time are boring and impersonal, but when that movie is focused on Meg and Alex, it’s much more involving. Middle of Nowhere is nothing but delicate interactions like that — it’s a deeply moving character drama about a woman figuring out what she wants out of life and the shy man who’s trying to win her heart. It’s a small gem worth seeking out on your favorite streaming platform. #3. Conservative Christians are mad that the movie isn’t as Christian as the original book. But they hated the book, too. Madeleine L’Engle, who died in 2007 at the age of 88, was primarily known for two things: writing beloved children’s books and for being a Christian writer. Because of our cultural climate, where everything becomes ridiculously polarized, it’s important to point out, however, that L’Engle was not “Christian” in the way that we currently think of the term. For instance, she was actually pro-science, insisting that you could be a person of faith and still believe in basic scientific principles. Scheer can’t see why the film should be less God-centric, contending that, just as Meg is fighting against evil cosmic forces in the movie, “Christianity is explicitly and timelessly about the battle between good and evil, the fight between the light and the dark.” I haven’t read L’Engle’s book, but what’s good about DuVernay’s film is that it is about the basic tenets of Christianity — being kind to your fellow humans, spreading goodness and charity — but without attaching it to any one heavenly deity. Wherever she may be, L’Engle is probably having a great laugh about Christians deciding to freak out about her movie. More than 10 years after her death, her classic work is still doing some excellent trolling.